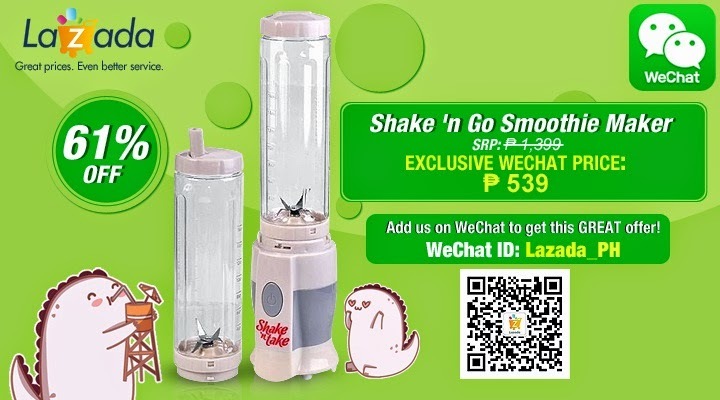 Great Discount on Shake ‘n Go Smoothie Maker from Lazada PH via WeChat! Summer has officially started. And while some of you are heading off to lounge on the beach soaking up the sunshine you've been craving, others prefer to stay home and cool off. And what better way to stay cool and refreshed all summer than having your own Shake ‘n Go Smoothie Maker! That's right! Get 61% off on Shake 'n Go Smoothie Maker from Lazada Philippines through WeChat and you can avail the Shake ‘n Go for only P539, instead of P1399.00! Download the WeChat app and follow @Lazada_PH to avail of this exclusive deal. The Shake ‘n Go enables you to easily and quickly whip up some yummy beverages that can be filled with your desired ingredients. The strong motor powers the stainless steel blades are attached at the bottom of the bottle. Within a few seconds, you get to drink a cool, smooth, delicious, and nutritious drink. The portable container has a built-in spout so you can drink directly from the container. Guaranteed no spills, this handy appliance is a great must-have for health-conscious people, fitness buffs, joggers, or just about anyone. Hurry and order this exclusive deal today! Follow @Lazada_PH on WeChat and enjoy more exclusive deals like this in future. Learn more about Lazada and download the app on iTunes here, and on Google PlayStore here. WeChat is available free for download on Android, BlackBerry, iOS, Symbian and Windows operating systems. Learn more and download the app at www.wechat.com. follow WeChat Philippines and Lazada Philippines' Facebook pages. Last time, they were offering tablets for 999, now it's Shake n Go. I really love Wechat's offerings. Whoa, Lazada going WeChat?! Nice move! Wow. Hearing a lot of giveaways from these 2 parties. And all are nice giveaways, more power.